For more information, visit our UltraFiber Website. Solomon UltraFiber 500 is an alkaline resistant cellulose fiber reinforcement for Commercial and Residential Slabs, Composite Metal Decks, Paving, Pervious Paving, Curb and Gutter, Slip Form, Architectural and Decorative, Shotcrete, Wall, and White Topping applications. UltraFiber 500 provides excellent secondary reinforcement, is safe and easy to use, and provides superior finishability. It can replace traditional secondary reinforcement while improving durability, impact resistance, shatter resistance, and freeze/thaw resistance. Bonding between rebar and cement paste is improved while concrete permeability and absorption is reduced. Unlike Polypropylene fiber, UltraFiber 500 is invisible in concrete, does not ball, fuzz, or blemish. It yields an aesthetically perfect finish with no special finishing practices. Also, unlike Polypropylene fiber, UltraFiber 500 is derived from renewable resources. UltraFiber 500 has superb finishing quality, unsurpassed crack control, better hydration and bonding, is great for decorative and colored concrete, and utilizes an automated dispensing system. Solomon UltraFiber 500 is perfect for home applications. It is invisible in concrete, meaning it will not blemish the surface of your concrete. It also accepts color, meaning your concrete can be strong and beautiful. UltraFiber500 makes your concrete surfaces stronger, more durable, and longer lasting. It is perfect for both wet and cold climates because UltraFiber 500 reduces the effect of the freeze/thaw cycle and decreases the concrete’s absorption of water. Unsurpassed crack control means your concrete will last longer and save you money. Using UltraFiber 500 in your home will keep your beautiful concrete just the way it is for a long time to come. Solomon UltraFiber 500 is gives unparalleled flexibility when spec’ing your project. Not only does it greatly increase strength, durability, impact resistance, shatter resistance, and freeze/thaw resistance, it does not interfere with the appearance of the concrete. UltraFiber 500 is not visible once the concrete is poured and it does not interfere with color when concrete is colored, making it perfect for decorative and colored concrete. The improved strength of concrete makes more dramatic and seemingly fragile designs a reality. Spec’ing UltraFiber 500 means improved concrete with no compromise. Fiberous Reinforcing – section 03240 (03 24 00) Spec covers Solomon UltraFiber 500 Alkali-resistant, virgin cellulose concrete reinforcing fiber. Solomon UltraFiber 500 is the most workable fiber reinforcement. UltraFiber 500 does not ball, fuzz, clump, or build up on finishing tools. It does not require any special finishing techniques, unlike Polypropylene fiber, yet it does not affect the final appearance of the finish. UltraFiber 500 controls cracking due to plastic shrinkage and thermal expansion/contraction. It reduces water migration and increases impact capacity and shatter resistance. It is easily dosed at 1.0 to 1.5 lb/yd3 rates for most applications and 2.0 to 4.0 lb/yd3 rates for more demanding applications. To top it all off, the Solomon UltraFiber 500 Automated Dispensing System (avaliable for no capital investment) makes dosage easier, safer, and more accurate. Solomon UltraFiber 500 is the easiest way to make your concrete the best it can be. 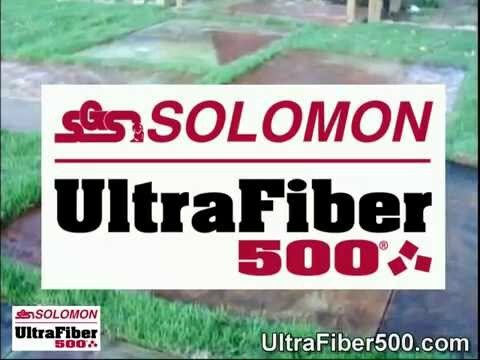 Solomon UltraFiber 500 is perfect for colored and decorative concrete as dyes and stains are readily accepted by the fiber. Solomon UltraFiber500® provides excellent secondary reinforcement from high fiber surface area, close fiber spacing, excellent bonding within the cement matrix, high fiber tensile strength, and easy dispersion in concrete so it is always positioned correctly. Solomon UltraFiber 500 reduces surface cracking in concrete and enhances hydration which improves concrete strength properties. The Solomon UltraFiber 500 Automated Dispensing System is the ultimate solution for fiber dispensing and reinforcement. It is available to distributors with NO CAPITAL INVESTMENT. It is reliable, efficient, safe, and ensures greater quality.